"Lummer Land" 3D Puzzle for the theme "Jim Button and Luke the engin driver". Ideal in combination with the "Jim Button" play mat. Lummer Land, the small island with two mountains, thrills children and provides a great play adventure with the theme world "Jim Button and Lukas the Locomotive Engineer". 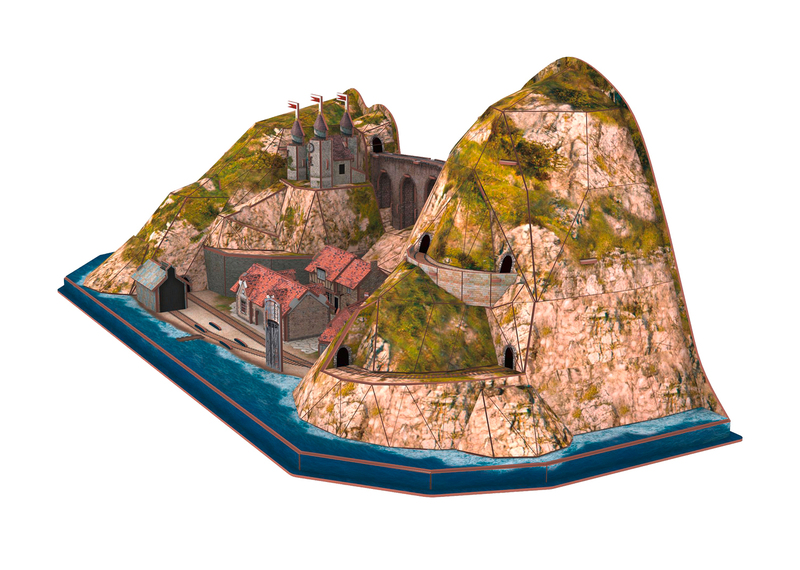 An island with two mountains – Lummer Land as a 3D puzzle with the homes of its inhabitants, the Lummer Land citizens: Lukas the locomotive engineer, his steam locomotive Emma, Jim Button, Mrs. Waas, Mr. Ärmel and King Alfons. The island can be built from the individual parts without the need for tools or glue. This 3D puzzle is suitable for children ages 8 and above. Create your three-dimensional "Jim Button" theme world with the 3D puzzle of Lummer Land and other products for the theme "Jim Button and Luke the engin driver".